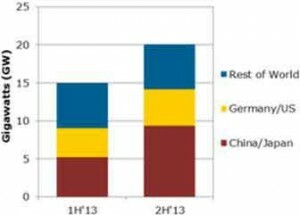 Due to aggressive PV development in China and Japan, the full year 2013 global solar photovoltaic (PV) demand is expected to increase to a record high of 35.1 gigawatts. Meanwhile, during the second half of 2013, demand is forecast to reach 20 GW, up 22% Y/Y, according to the new NPD Solarbuzz Quarterly report. As reported, global PV demand during 1H’13 reached 15 GW, up 9% compared to the same period in 2012. More than 60% of 1H’13 demand came from four countries: Germany, China, Japan, and the US. Global PV installations were led by large-scale utility and commercial ground-mount applications, which provided 45% of first-half PV demand. Residential rooftop applications accounted for approximately 20%, with the remainder coming from non-residential rooftop installations and off-grid applications. During 2H’13, PV deployment from just two countries—China and Japan—is forecast to account for more than 45% of global PV demand. While the European region accounted for almost half of global PV demand during 2H’12, this figure will decline to less than 30% during 2H’13, the report remarks. NPD Solarbuzz, part of The NPD Group, offers Marketbuzz, Solarbuzz Quarterly, and annual downstream photovoltaic (PV) market reports, providing the solar energy and PV industries with global historical and forecast data for the PV supply chain.